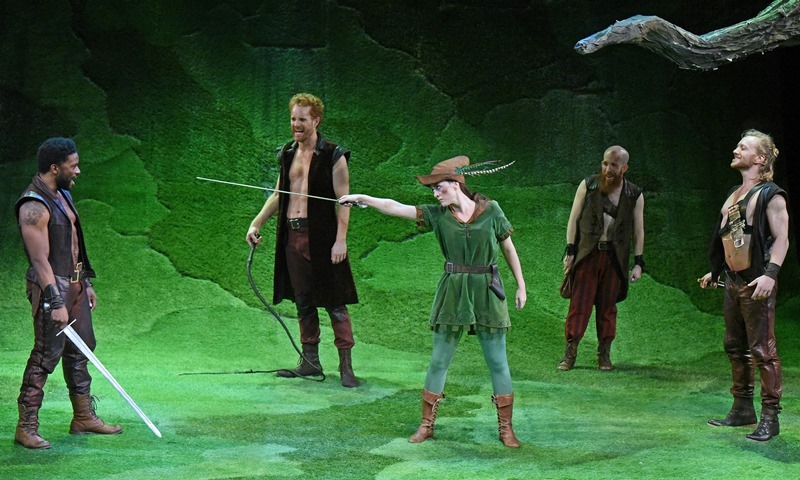 This year for the holidays, The Wallis has traded its typical musical theatre fare (Into the Woods/2014, Guys & Dolls/2015, Merrily We Roll Along/2016) for something a little less traditional but even more imaginative and fun - Vesturport Theatre’s The Heart of Robin Hood by playwright David Farr. 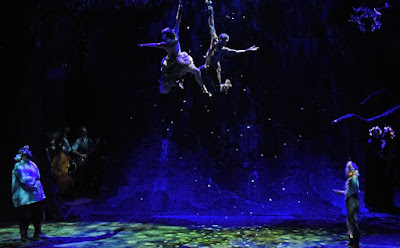 Directed by Gisli Örn Gardarsson and Selma Björnsdóttir, it does contain music (beautiful songs by Icelandic pop star Salka Sól) but the hybrid production also incorporates elements like aerial and floor acrobatics and a unique floor-to-ceiling forest wall that allows the actors to slide in and traverse its trap doors and crevices like they’re on a crazy obstacle course. The heightened physicality adds a playfulness to the piece and the athleticism of its sword fights and combat scenes lend a rousing intensity. Deaths are grisly, romance is a given, and an underlying earthiness characterizes the passions that arise throughout. Heart is a twist on the tale of Robin Hood (Luke Forbes) going back to the days before he stole from the rich and gave to the poor when he and his merry men were merely self-centered thieves. 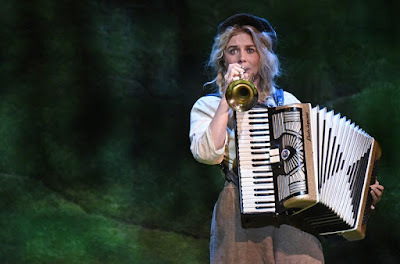 The dour ruffian refuses to let women into his band with the explanation, “A woman causes tempests in the heart of a man.” While we never find out exactly what prompts him to adopt the rule, we know he will have a change of heart by the end of the tale, and that change will be inspired by a woman. 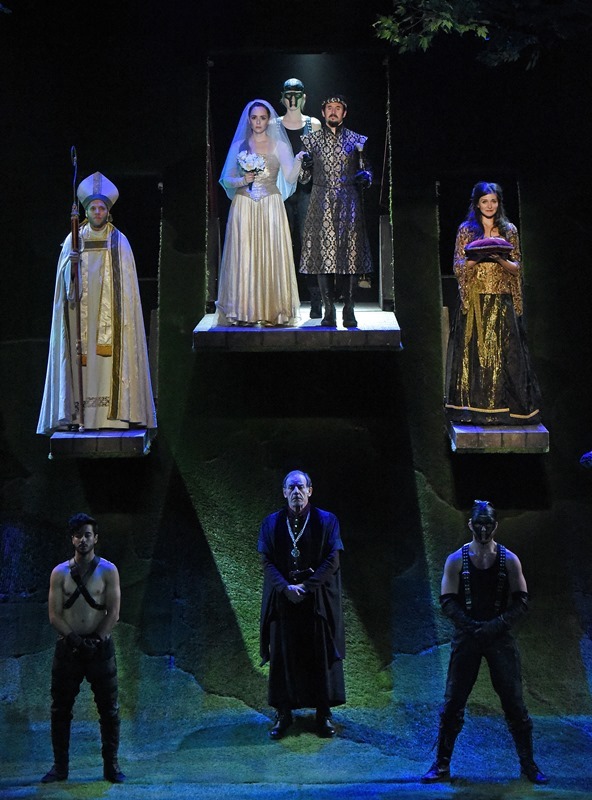 The woman is Lady Marion (Christina Bennett Lind), the willful, independent daughter of the Duke of York (Ian Merrigan) who, to escape her impending marriage to the villainous Prince John (Eirik del Barco Soleglad), flees to the forest. Disguised as a boy and inspired by a disastrous earlier meeting with Robin, she decides to form her own gang of thieves. But unlike Robin’s marauding band of bare-chested brawlers, her mission is selfless. She distributes her spoils to those in need and quickly becomes the beloved champion of the downtrodden. 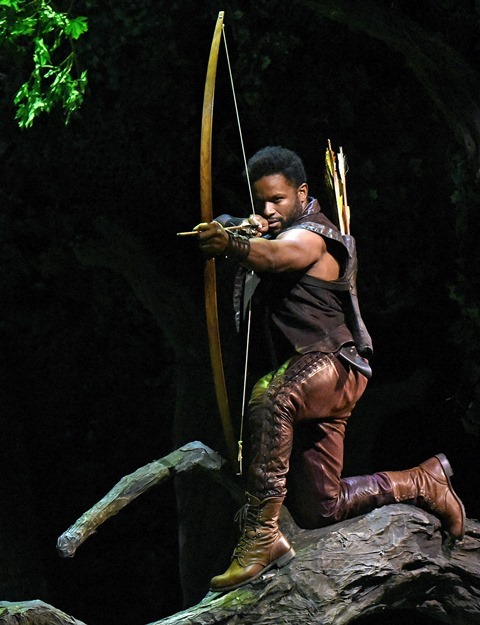 When Robin finds out this new “Martin of Sherwood” is encroaching on his territory, he furiously vows to kill him. Farr (whose 2016 mini-series The Night Manager was a huge hit with television audiences) first directed his play at the Royal Shakespeare Company in 2011. 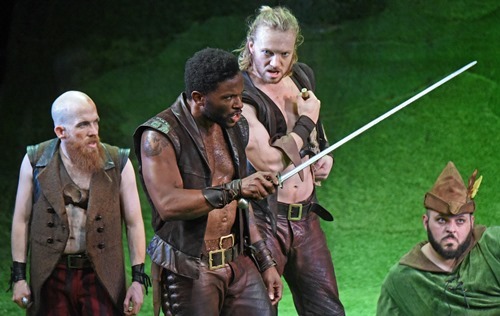 His nods to Shakespeare are unmistakable and those who know the canon will find many parallels. Marion’s journey mirrors that of Rosalind’s in As You Like It. 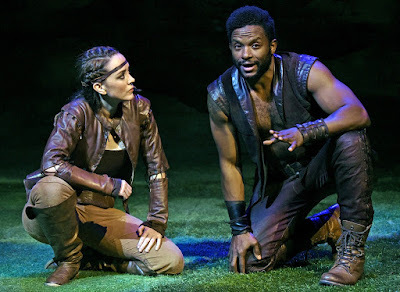 She is accompanied by her fool, Pierre (Daniel Franzese), an effeminate and comical twist on Touchstone, and in her guise as Martin, must hide her attraction to Robin in a Rosalind/Orlando rip-off. 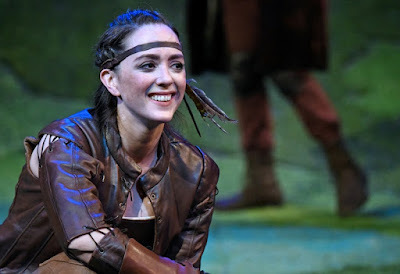 Borrowing from The Taming of the Shrew, Marion’s relationship with younger sister Alice (Sarah Hunt) has much in common with Kate and Bianca (although Alice is the shrewish one of this pair). If you know Twelfth Night, you’ll hear a callback to Malvolio’s last declaration in Prince John’s final words and, like all typical Shakespearean comedies, it ends in a wedding. The style is broad and rife with innuendo. Forbes and Lind spar both verbally and at opposite ends of a blade, causing sparks to fly on more than one level. He’s stubborn, she’s even more headstrong, and the hoops they end up jumping through on their way to a happy ending will give you the warm and fuzzy glow every hopeless romantic longs for by the time they lift off into the air in a final aerial pas de deux. 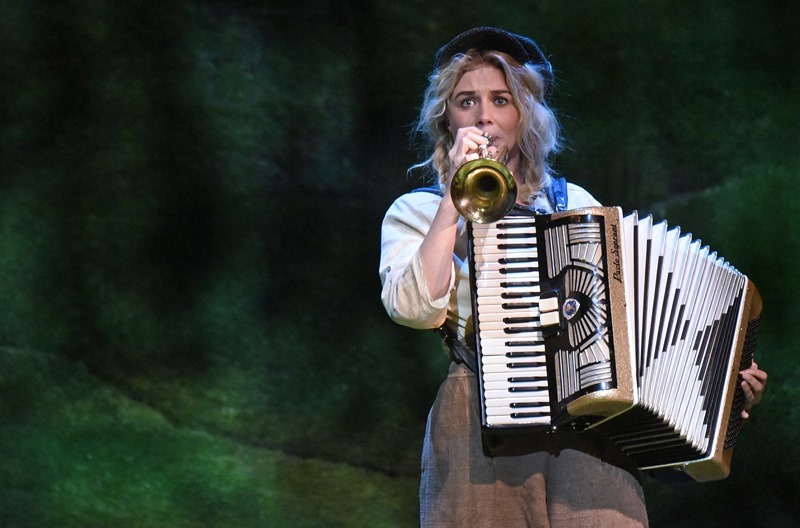 The score is a series of songs performed between scenes by Sól and her four musicians that capture the essence of what is about to happen on stage. The lovely singer has the kind of indie voice you can listen to all day and, as the action intensifies, so does her song style. In the early scenes, melodies meander with a folk lilt and quirky, winsome charm before giving way to a more insistent rap style. Lyrics can be difficult to understand so pay close attention. Brian Hsieh’s graceful soundscape evokes the stealth and joy of the forest in all its cycles. It is almost imperceptible at times but the way it effortlessly enhances the tone of a scene is quite beautiful. Scenic designer Börkur Jónsson’s set makes its grand entrance the minute you walk into the theater and is enough to take your breath away at the sheer amount of lush greenery that fills the stage. It transforms under Ken Billington & Ed McCarthy’s richly dramatic lighting in surprising ways. 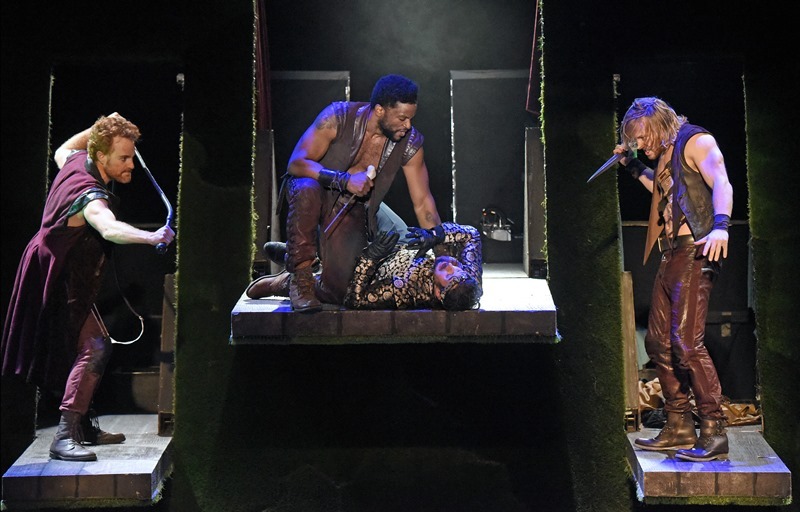 The Wallis never does anything halfway and with The Heart of Robin Hood they have taken another bold step forward in presenting first-rate live entertainment. This is a fairy tale with grit, sophistication, and the kind of devilish creativity a modern audience can go crazy over. (And it doesn’t hurt that you’ll find a rogue for every taste among the splendid cast).